Hot Humberto modelled to build HIGH over UK next weekend! 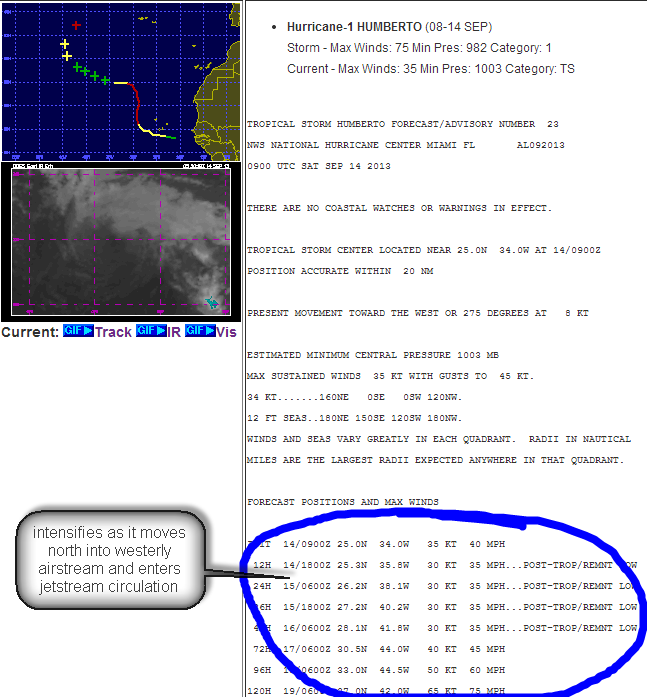 Hurricane Humberto: a hurricane which left Cape Verde on 8 Sept and has been hovering in the Tropics ever since. 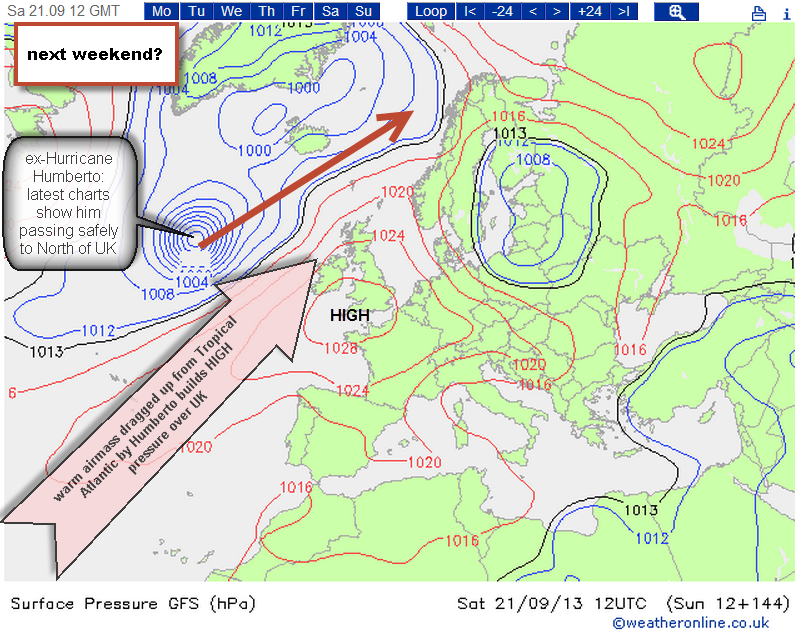 Early models suggested a direct hit with the UK sometime next weekend which would have been wet and breezy. Latest charts show HUmberto gliding safely north of the UK. The GOOD thing about this is that Humberto will bring a great deal of Tropical warmth with him, especially on the south side. The heat embedded within the Humberto circulation will push warm upper winds from the Azores area north and build an upper ridge and surface HIGH pressure over the UK from the end of the week and hopefully over the weekend. Warm air moving north aloft lifts air pressure through the whole warming column of the atmosphere and the result is increased surface pressure: an anticyclone (opposite of this weekend!). Humberto is currently just a tropical depression having lost energy over a cooler part of the mid-Atlantic. However, he is due to intensify when he meets the mid-latitude westerly circulation around the end of the week and entering the jetstream will deepen circulation further creating an extra-tropical mid latitude depression. Charts say this will pass between the UK and Iceland… check back for updates. So, it’s a way off to be sure, but the latest models seem to be pointing towards a nice weekend courtesy of Tropical Cyclone Humberto. Interestingly, Humberto left West Africa on 8 Sept and the first significant landfall he will make might well be Iceland next weekend!